← Matula Thoughts June 2, 2017. This commentary from the University of Michigan Department of Urology is sent out on the first Friday of each month in two versions, the email What’s New publication and the web posting matulathoughts.org. Matula is an ancient term for diagnostic flasks once used to inspect urine. July delivers a new cadre of interns/residents to hospitals around the country in the midst of divisive national controversy over healthcare. Momentary acronyms – ACA, MACRA, MIPS, AHCA, BCRA, etc. – rivet public attention, just as the next acronyms de jour will do a few years hence. Whatever paradigms and regulations spill out of Washington, the daily clinical work of healthcare, education of our next generation, and expansion of knowledge and technology will continue. New house officers leaping out of their starting gates this month may scarcely notice the regulatory nuances and social policy debates. I hardly noticed such matters at a similar time in my life in 1971, but today the impact of healthcare legislation and regulation seems increasingly important. These matters, furthermore, are deeply linked to the principles celebrated this past week, because foremost in America’s ongoing republican experiment is belief in human rights and self-determination and these are inextricable from health. The Lancet last month included a relevant statement from a World Health Organization Working Group, speaking for health and human rights of women, children, and adolescents, but applying equally to all human beings and expressing the principles of The Declaration. The particular vulnerability of women, children, and adolescents throughout most of the world is a tragic reality built on countless stories, known and unknown. The Working Group comment extends beyond its particular portfolio because all human beings are vulnerable to catastrophes of climate, geology, famine, war, oppression, violence, economics, and biology. House officers and fellows explain their attraction to medical careers, at least in part, by belief in social justice and the opportunity to help people. Medical school debt, duty hours, documentation-compliance, RVUs, and personal well-being dampen those original attractors. Acrimonious debates on healthcare legislation center around views of healthcare as a right as opposed to healthcare as a commodity and personal responsibility. The words right and responsibility require deeper consideration, for example in a recent radio interview Tom DeLay, former U.S. Representative from Texas (1979-1983, 1985-2006) and House Majority Leader (2003-2005) stated he doesn’t believe that health is a right, but rather a responsibility. [Interview on NPR with Jeanine Herbst March 22, 2017.] His point that government has no “constitutional role in health insurance” is accurate from a textual Constitutional perspective, however to reduce the generality of healthcare to the particularity of health care insurance is neither logical nor helpful in the national debate. I use the DeLay quote only to introduce the consideration of healthcare as a right, not because of any claim to healthcare expertise or salutary wisdom regarding social justice he might offer. The truth in healthcare is close to home for most people. Health care involves each of us from antenatal days to final days of life. It is not productive to frame the national healthcare debate in the context of healthcare insurance, as insurance is only one method to fund a nation’s healthcare needs. Viewing the enormous panorama of national healthcare from only the insurance perspective makes no more sense than expecting the motor vehicle insurance sector to cover all motor vehicle costs including purchase, gasoline, cleaning, maintenance, safety inspections, collision repair, and damage from acts of nature, as well as highway safety, research and development, petrochemical sourcing, and traffic control. 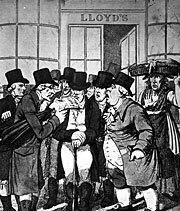 The insurance industry, arguably, began at Lloyds Coffee House in 1686 of London as a source of shipping news and later marine insurance to mitigate catastrophic risks of sea commerce (above c. 1800 unknown cartoonist. Wikipedia). Insurance did not cover all expenses of sea trade, it covered true catastrophe, not operating costs, torn sails, or men overboard. The origin and evolution of American health insurance and the co-mingling of it with employment status is a story with many twists and turns, and federal involvement added further complexity. The result is an intertwined morass of funding streams and regulations, kinda looking like the Lloyd’s cartoon above. Rather than partisan ping pong, the solution to the national healthcare dilemma requires thoughtful bipartisan consideration of a framework to define rational public and private domains, responsibilities, and funding. Debate, essential to democracy, requires free speech and an open society that embraces education and cosmopolitanism. Conversations that challenge opinions, introduce ideas, and work toward consensus are fundamental to civic life as well as just and constructive public policies. This is how democracy works best, whether on national stages or in local workplaces. We bring debate to Michigan Urology with point-counterpoint sessions at Grand Rounds when two residents square off with contrasting points of view to sway the rest of us. Our discussions are more prosaic than debates of health care as a right or commodity, because we are focused on learning urology. For example, Parth Shah recently offered the opinion that radical cystectomy should be performed by traditional open technique while Zach Koloff argued for the robotic platform (pictured above). They reinforced their positions with historical perspective and current data, deploying classic elements of argument. The impeccable characters of Zach and Parth represented ethos, their data supported logos of their claims, and considerations of pain, costs, complications, learning curves, and fiduciary responsibility bore pathos in the traditional rhetoric triad. The hospital conference room, newly refinished, was pretty much at capacity with about 45 in attendance including the usual 4-6 lurking at the back of the room with coffee and opportunity for stealthy egress. The recurring biologic experiment of civilization evolved occasionally from the social networks animals depend upon to maintain each generation. A few eusocial species, if I may flip back to the writings of E.O. Wilson, create societies that successfully and become durable “megaspecies” in and of themselves. Wasp, bees, and ants are most notable, using chemicals or motions for communication. Specific signals trigger unified mass social actions such as directional movement, panic, or war. Ants, for example, manage their colonies with pheromones. The human advantage with civilizations is an ability to build and change them over centuries through communications transcending many generations and even millennia, allowing learning, creativity, and innovation. Individuals apply critical thinking, reexamine assumptions, experiment, analyze methodologically, and cooperate for durable change, passing information along to successive generations. Individuals naturally have individual points of view and debate allows cooperation and learning, leading to resolution, reconciliation, and centrism. A strong center is essential for robust civilization, but just as ants and bees, humans are subject to mass manipulation by signals that, usually for us are money, ideology, propaganda, quackery, or charisma. Conspiracy theories attract and entertain. We are drawn to them, being hardwired to favor stories that fit our predispositions or play to our anxieties. Conspiracy ideas provide lazy mental short-circuits that displace critical thinking and rational re-examination of assumptions. Some conspiracies, of course, prove authentic, although my limited experience in the military and as an amateur student of history, is that major conspiracies are unlikely to remain long-concealed. Democracy is leaky due to First Amendment protections of free speech. Rare exceptions, such as campaigns that “loose lips sink ships” or the Manhattan Project, demonstrate that free society can maintain secrecy for critical intervals on rare occasions when the need is essential and widely understood. The rarity of these exceptions preserves their exceptionalism. When a regime tilts toward authoritarian rule and censorship becomes common, democracy slides away. It is not wrong that news sources are polarized. The left side of the political spectrum reads left-sided sources while the right reads right-sided sources, and everyone blends opinions, facts, and stories to support their myths and to ascertain facts. The middle of the political spectrum is where democracy finds its balance, but sources of news and opinion that the center trusts are uncertain and conspiracy fears can spread like viruses. On this day in 1947 Major Jesse Marcel, intelligence officer of the 509th Bomber Group at Roswell Army Air Field inspected a debris field where an incident was claimed to have happened. [Above: Roswell Daily Record, July 8, 1947] Stories still emanate from that incident, blending facts and myths with no commonly-held authoritative version, but only colorful conspiracy theories. Those of us who grew up with the original X-Files series (1993-2002), centered around Roswell-type mysteries, are familiar with the haunting tune and the invitation to further inquiry: “the truth is out there.” The quest for truth is humanity’s big challenge. All living creatures discern information from ambient noise. We humans create stories out of information and from the stories invent myths, models, and theories to derive meaning and utility. Careful analysis, by verification or scientific testing, pulls truth from facts, myths, models, and theories, nonetheless, truth remains elusive. The intersection of news and entertainment risks confusion and credibility as when the radio broadcast War of the Worlds in 1938 by Orson Wells created a minor panic for listeners who tuned in after its introduction as a radio play and thought that Martians were actually invading Earth. When trusted news anchors portray their roles in TV and film fiction they diminish their credibility. Worse, deliberate fake news tilts political opinion and instigates conspiracy fears that cannibalize civilized society by devouring trust that is the currency of civilized people. True facts. The story of Jack Lapides, former chief of urology here at Michigan, educator, and innovator (above) was briefly told in an obituary column his sister requested after he passed away. [New York Times. Nov 19, 1995] (The published version has a single typo, introduced by the newspaper that must have thought the reference to Charles Huggins was “Charles Higgins.”) Jack’s surgical accomplishments continue to show up in urology clinics around the world, illustrating the long reach of an innovative surgeon. Surgeons fix problems, and one of Jack’s surgical innovations was the vesicostomy, a solution for bladder and sphincteric dysfunction by making an opening on the abdominal wall. Pediatric urologists utilize vesicostomy occasionally. Keith Schneider, pediatric surgeon in New York, and John Duckett, pediatric urologist in Philadelphia, subsequently described vesicostomy techniques of their own, but these were mostly replaced by Lapides’s clean intermittent catheterization methods after 1971 and the reconstruction approaches of W. Hardy Hendren. We honor the Duckett and Lapides names with lectureships here in Ann Arbor in July, as the first academic events of the residency training season. I carry the Lapides name with my endowed professorship and Hardy (mentor to John Park) continues to be an inspiration and friend to many of us in Ann Arbor. Intersecting story. Last year our departmental office got a call from Peggy Hawkins of Chevy Chase, Maryland, who identified herself as the sister of a former Lapides patient in need of help. Her brother, we can call Larry, was living in Florida and dependent on a vesicostomy Lapides created in June, 1968, but Larry was having trouble obtaining stomal supplies. Peggy, recalling the name Lapides, contacted our office for help. I called Larry and we got him in touch with our UM stomal experts who found some solutions. Peggy called back recently to tell me that Larry recently passed away and filled me in on Larry’s amazing story. She assures me that Larry would have been pleased to share the following details of his life, particularly the importance of his vesicostomy to him. Born in 1943, Larry was the only son in a family with two sisters. Popular and athletic, he played football and ran track in high school. After graduation from college with a major in political science he joined the United States Army as a Second Lieutenant and married his girl-friend. Larry was sent to Vietnam with the 173rd Airborne Brigade in 1967. The Tét Offensive changed his life. Launched on January 30, 1968 by 80,000 North Vietnamese and Viet Cong forces during the Tét lunar new year holiday, the offensive was a coordinated series of attacks on over 100 cities and towns in South Vietnam. A mortar round that first day exploded just behind Larry causing tremendous concussive injury to his back and spinal cord with extensive shrapnel injuries, particularly to lung, liver, and upper extremities. The triage officer didn’t expect him to live, but Larry defied expectations and survived first to the field hospital, then to a general hospital in Japan, and next to Valley Forge Army Hospital in Pennsylvania, but with paraplegia and consequent lower urinary tract dysfunction that translated to sepsis and upper tract deterioration. His medical condition continued to decline at Valley Forge and around this time a son was born. Larry separated from the Army in June, 1968 and was sent to the Ann Arbor VA that month where he came under the care of Jack Lapides who understood the deleterious nature of high pressures in the neurogenic bladder who explained that vesicostomy might extend Larry’s life another ten years, Peggy recalled. The procedure that June turned around Larry’s deteriorating clinical course and provided him another 48 years of independent life without urinary tract problems as long as he had access to stomal supplies. After recovering from the operation and stabilization of his health Larry enrolled in law school in the fall of 1969, living in a nearby apartment with reasonable wheelchair access. With his Juris Doctorate he moved to Florida in 1972 mainly because of the flat terrain and more favorable climate, finding work in politics early on as an advocate for Veterans in Tallahassee. Larry received a Purple Heart and Bronze Star (above) with a “V” Device (for valor) in 1974. In 1978 he ran for public office and served 4 terms (1978-1986) in the Florida House of Representatives where he chaired the Veterans Affairs Committee and impacted a groundbreaking generic drug law. He was elected Dade County Commissioner 1988-1994 and sponsored nation’s first family leave ordinance (Miami-Dade employees 1992), helped the Miami community recover after Hurricane Andrew and found creative solutions to the influx of Haitian immigrants in Jackson Memorial Hospital and Dade County Public Schools. Larry served on the Board of Vietnam Veterans of America. His network of political friends included Bill Clinton and Senator Tom Harkin, who introduced the Americans with Disabilities Act in the Senate. Larry’s son died at age 34 in 2002, leaving Larry 2 grandchildren – a granddaughter who teaches kindergarten and a grandson currently serving in the Army. His step-son works for the U.S. Secret Service. During his 48 years with a stoma Larry was able to engage socially and professionally. Never in those 48 years did he have a UTI, upper tract problems, or stomal problems, although access to stomal appliances, necessary for daily peace of mind, became increasingly difficult as the market for them disappeared. Larry died recently from multisystem problems, but without urinary tract issues. He will be buried at Arlington National Cemetery. The Tét Offensive of 1968 continued through February. Although a military defeat for the North it intensified the American public opposition to the war and created a crisis in the Johnson administration. The “credibility gap” that had become apparent in 1967 widened in 1968, the year US casualties peaked with 16,592 soldiers killed. In February that year the US Selective service called for a draft of 48,000 men and on February 28 Secretary of Defense Robert McNamara stepped down from office. McNamara had been a long-time college friend of my UCLA urology professor Willard Goodwin and coincidentally lived in Ann Arbor for a short period as president of Ford Motor Company. As early as mid-1966 McNamara, as defense secretary believed that “there was no reasonable way to bring the war to an end soon” and that we should quickly find a political solution with North Vietnam and the Viet Cong. These were marginal opinions in the Johnson administration. [McNamara. In Retrospect. 1995. P 262] Many conspiracy theories abounded about the Vietnam War and some still resonate, but McNamara’s book lays out the story clearly, explaining the mistakes of management, failures of duty, and sins of pride led to escalation of conflict and flew out of control. The Fog of War. Lessons from the Life of Robert S. McNamara, a film by Errol Morris and a book by James Blight and Janet Lang, explains the cautionary tale. Chang Lecture. Medicine without art is a commodity. Not to disparage commodities, we expect them to be dependable, available, and standard in quality. With health care however we prize human values of excellence, kindness, discernment, attention, discovery, innovation, and even virtuosity. For all of us as patients and families, our healthcare needs and expectations go beyond mere provision of commodities. Many services in medicine can be managed as commodities: blood pressure screenings, flu shots, blood draws, and dental hygiene are typical examples, although even these can be done artfully or not. The routine blood pressure check requires thoughtful matching of cuff to body size and a few minutes of relaxation that puts the recipient at ease. Any human performance can be given with care, enthusiasm, and art – or not. My aunt Evelyn Brodzinski, an artist, once said “Art is anything that is choice” after I asked her “What is art?” I quote her definition often. Art consists of the choices we make in the performances we give, whether delivery of a job, doodling on paper, whistling a tune, writing an essay, taking a picture, drawing a blood sample, or doing a surgical procedure. Any vocation can and should be performed artfully. Universities have a duty to propel this aspiration in all their fields of study, and the artful provision of healthcare should be at the top of any list of fields. The study of art is the study of choices in the world. We began the Chang Lecture on Art and Medicine in recognition of this obligation of our university. Such a lecture could just as easily come out of any of the 30 departments in our Medical School. It could also have come from Michigan’s Department of Art History or School of Social Work. We brought it forward from the Department of Urology inspired by the linkage of art and medicine in the family of Dr. Cheng-Yang Chang, a urologist who trained and practiced at the University of Michigan, as well as founded a medical school in Taiwan and later practiced in Flint. His father, Ku-Nien Chang was a famous painter in China and Dr. Chang’s oldest son is a urologist in Albany NY, trained here in Ann Arbor under Ed McGuire. Dr. Chang’s youngest son is a financial analyst in Chicago and one of UM’s best alumni supporters. This year Dr. David Watts, a prominent gastroenterologist in San Francisco and nationally-known humanist, will give the Chang Lecture July 20, 5 PM, Ford Auditorium.